Young students at Maranatha Christian Academy have a new place where they can share ideas and let their imaginations run free. The new high-tech library and STEAM center opened in January, and it’s already a big hit with students. “I like that we get to be creative,” said a second-grade girl. The center has two components, literacy and technology. “We learn CAAD, so computerized design and then they can print their designs on the 3-D printer,” explained STEAM Instructor Syrena Schonning. “They were inspired by the character in the story. 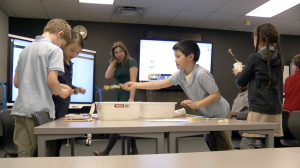 She was trying to invent something that was in her mind, and she couldn’t get it out,” said Learning Commons Specialist Stacy Huether. The students then took the lesson they learned from the book and created their most magnificent thing. The young students were very creative. One team of students make a bridge out of pipe cleaners, cups, and paper. There are no guidelines. Students are free to create. Teachers say they’ve seen a difference since the center opened, students are work better with their teammates, and most importantly students are more confident. “They’re more comfortable sharing ideas. They’re not afraid to share their ideas if they’re given the opportunity to create,” said Huether. Skills students will be able to use when they become adults. “When they graduate, and they’re looking for careers. I want to give them the confidence to go for something like computers or engineering in college if that’s something they’re interested in,” said Schonning. Students in upper grades also have a library and technology center.